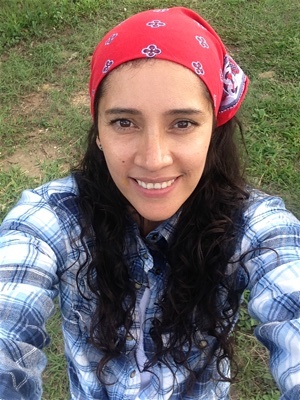 Selfie taken by Esme on the way to the canyon. In the afternoon, Esme and I left to for the nearyby town of Chavarrillo. We had planned to do another evening hike in the nearby canyon; our fourth one this year. The reason I wanted to go back once more is that on our first hike this year I had found a specimen of Centruroides rileyi. A species I had never encountered before and was not known from this area. 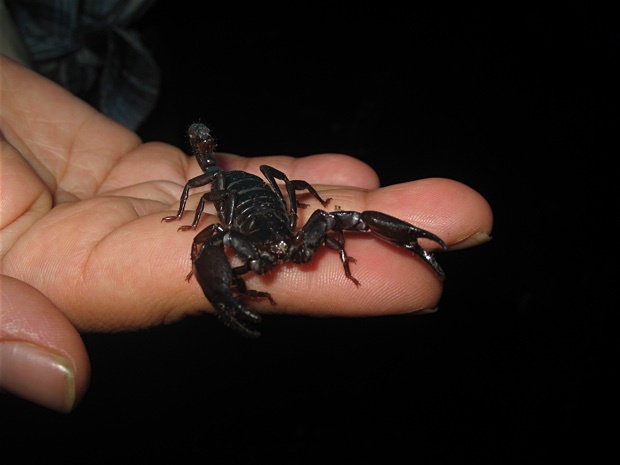 The very small scorpion was a male with only one functioning arm and had died in captivity shortly after for unknown reasons. Before we started our hike we first went to the house of the brother-in-law of a taxi driver we had met on the previous visit to Chavarrillo. The taxi was parked in front of the house, so that was a good sign. The driver was indeed visiting his brother-in-law. We asked if he could drive us back to our house in Xalapa once more and we agreed to be back around 10 o'clock. 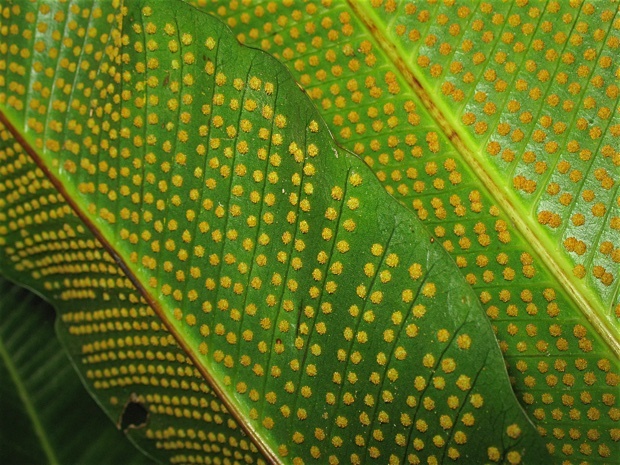 Close-up of spores under fern fronds. As there was plenty of daylight, it was close to six o'clock, we kept looking around hoping to see keel-billed toucans (Ramphastos sulfuratus). Several years back we had seen three of those birds in a large dead tree to the far left of the track we were taking. Sadly, the tree had been cut down or fallen down. We kept scanning the far away trees, but no sign of any toucan. 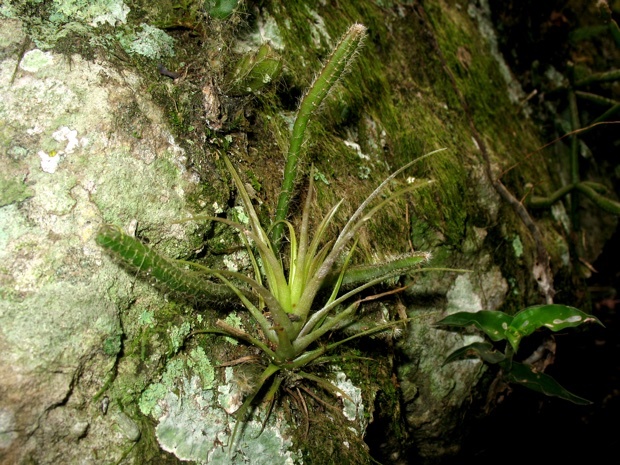 An airplant, Tillandsia sp., and cactus, Selenicereus sp., growing on a rock. Shortly after we arrived at the track going down into the canyon. We followed it a little down until an area where we often held a short break, which we did on this occasion as well. Near to the track is a very large clump of Aechmea nudicaulis a bromeliad. I like this plant a lot, and it was still flowering. Next and part in front of it was a large fern growing. I took a few photos of the underside of the fronds, which were covered in spores. 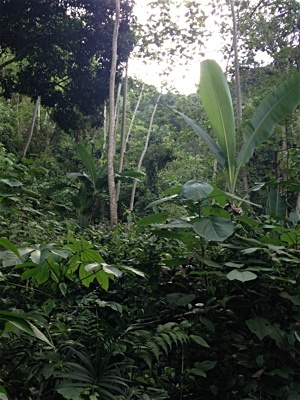 The very green jungle in the barranca (canyon). Photo taken by Esme. Close to the other side of the track was a rock with various plants growing on it, including a small airplant, Tillandsia sp., and a small cactus, Selenicereus sp., growing side by side. Near by I also spotted specimen of two begonia species: Begonia heracleifolia -- a species with beautiful star shaped variegated leaves -- and Begonia manicata -- a species with shiny, light green leaves. 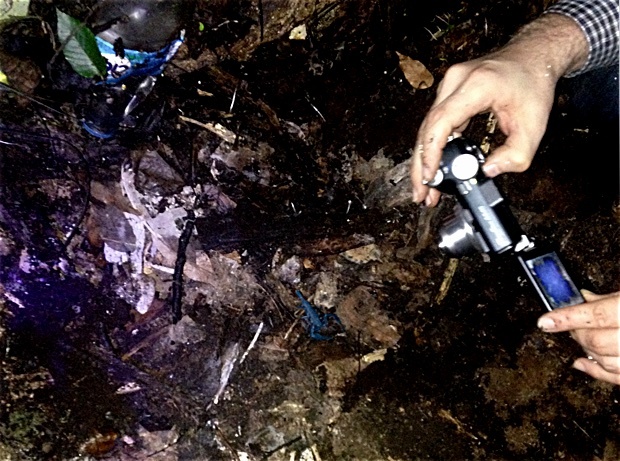 After some walking deeper into the barranca we decided to stop and wait until it would get dark enough to use our UV flashlights to spot scorpions. As we were just a few days short of the longest day this took a while. So, both bored of waiting, we started to walk back slowly before it was really dark, collecting the reflective strips we had hung in trees to mark our track for the return. Suddenly, I spotted two claws sticking out from a hole in the middle of the track. Glowing green thanks to the UV flashlight I was pointing in their direction. For sure a scorpion; Diplocentrus melici. But before I could draw Esme's attention, the claws had disappeared! Some time later... another pair of claws. This time I tried to remove the small rocks in the track to find the scorpion, but no luck. There were many spaces underneath the rock the scorpion could have disappeared into, deeper and deeper. We kept spotting claws of Diplocentrus melici employing sit and wait foraging. In holes in a muddy slope to the left of the track and under rocks part of the track itself. When we reached a large log to the left of the track I decided to roll it over. On past hikes I had done the same and each time we had found scorpions. Either Megacormus sp. or Diplocentrus melici. This time we first spotted what was obviously a male Diplocentrus melici. 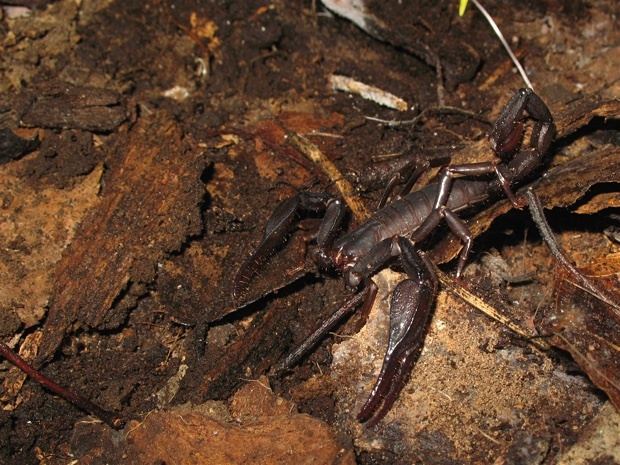 The author taking a photo of a scorpion; an adult male Diplocentrus melici. Photo taken by Esme. With adults of this species it's very easy to distinguish males from females. The former have claws with much longer fingers. Also the body of males is more elongated, almost rectangular, compared to females. Moreover, my experience is that females of this species are much easier to find compared to females, so this was a nice find. After I had taken a few photos the scorpion ran away; this species can be quite skittish. Close-up of an adult male Diplocentrus melici. Notice how well it blends in with its surroundings. Esme and I inspected the underside of the log, looking for scorpions belonging to the genus Megacormus, but none. Then Esme noticed another Diplocentrus melici near the other end of the log. This one looked like a subadult or small adult female. Esme holding a Diplocentrus melici. This is most likely a (sub)adult female. Notice the different shape of the claws; more round and shorter "fingers." Esme asked me if she could hold this specimen. She has held this species before. In our experience it is quite docile. It took some time before I had the scorpion on my hand and could transfer it to Esme's hand. Esme holding the same specimen, this time with UV light shining on it. Photo taken by Esme. While attempting to capture the scorpion I had disturbed a bunch of ants. No idea where they had come from, but my pants were covered, and some were biting my hands. 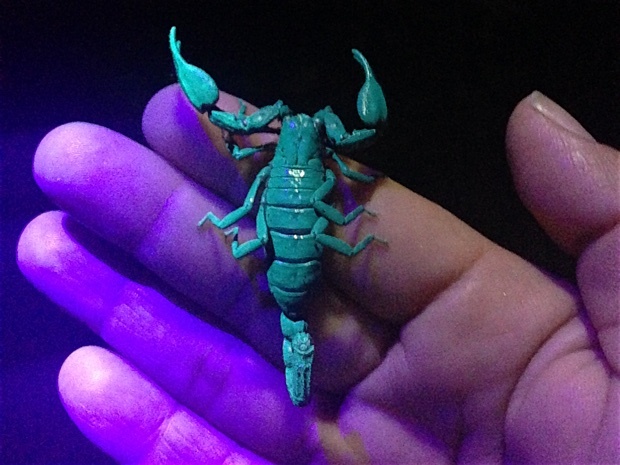 I brushed off the ones on my hands and most off my pants so I could help Esme making a photo of the scorpion on her hand lighted by UV from my flashlight. The same specimen after being released, once more with UV light shining on it. Photo taken by Esme. Shortly after Esme released the scorpion near the log. And together we rolled the heavy log back into place and we continued our walk back. I still kept finding ants on my clothes and kept brushing them off. It was now really dark so we kept on the look out for Centruroides rileyi but no luck. 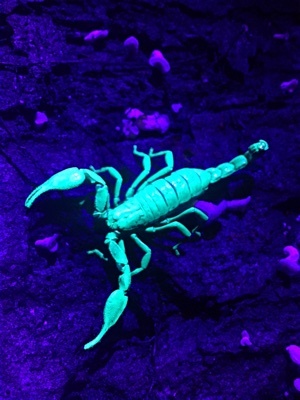 Nor did we encounter any scorpions belonging to the Megacormus genus. We collected the last reflective track marker and soon were back on the steep track that after several switch backs would lead us out of the canyon. On our way back we heard a very loud concert of Smilisca baudinii, the common Mexican tree frog. We also heard another frog species calling near a small stream, but couldn't find them. It had been raining a lot the past days but lucky for us no rain this evening. After about 15 more minutes we arrived in the town. I didn't check the time but I was sure it was very close to 10 o'clock when we arrived at the house in front of which the taxi was parked. And soon we were on our way, back to Xalapa.